Look to Him and be Radiant: What's Up? 1. I am moving. Ugh. I moved 5 times in 3 years during college, so I have gotten quite comfortable during my four years in this apartment in Oh-Henry. And by quite comfortable, I mean "How-can-one-person-possibly-own-this-much-stuff" comfortable. I am immersed in a world of boxes and Goodwill runs. More on that to come. Oh, and if you are looking for the opportunity to carry lots and lots of heavy boxes and furniture up a full flight of stairs in 100 degree heat the last Saturday, of this month, let me know. Don't all jump at once, now. 2. I was on an awesome retreat this past weekend. Well, I really wasn't on the retreat, I was chaperoning the retreat for 40 some high schoolers, but it was still awesome. The perfect mix of prayer, worship, teaching, games, and social. It was so good to be away from it all, to be with the kids for an extended amount of time, and to get to witness their walls coming down. I know that the weekend had an impact on them, and have seen some of its results already. The topic of the retreat was Blessed John Paul II's teaching called the Theology of the Body. Incredible material, given to the kids at such a critical time in their lives. I was blessed to be a part of it. 3. This isn't really news about me, but while I was on the retreat I got a phone call from my dear friends with some exciting news. 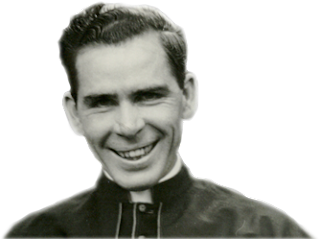 If you are from central Illinois or follow Catholic news, you may have heard that last week the Pope declared El Paso native Archbishop Fulton Sheen Venerable. This is a really big deal, meaning that he is one step closer to being recognized a Saint. The phone call that I got was my friends letting me know that now that Sheen is Venerable, the Diocese will be submitting the story of their son's (alleged) miraculous healing after having no heartbeat for the first 61 minutes of his life. If approved, James Fulton's "miracle" could advance Sheen to the next step of Beatification. Awesome does not even begin to describe the privilege of witnessing this experience through their family. 4. Completely unrelated, and incredibly more vapid- I should tell you all that my life is officially over. I gave in. And joined Pinterest. I am in big trouble. Let me know the details of your impending move. I would love to pack. Or if you need packers (because I'm not that great of a lifter); I can help with that too. Although, I know I always like to pack myself, that way I get things where I want them. AND I am going to officially Pinterest stock you...it will be the best decision you will ever make! Thanks, Kayla! I am packing/sorting as much as I can now, but would you be interested in helping me pack the last minute stuff the evening of the 26th or 27th? I am excited about Pinterest...once I have some time to sit down and browse. I am afraid it will be a rabbit hole and I will never see the light of day again!